CHARLOTTE, NC (WBTV) - Charlotte's late evening news landscape takes new form this spring as WBTV's News at Ten on CW 46 WJZY moves over to sister station My TV12 WMYT, the area's My Network affiliate. The change takes place beginning Monday April 9th with a one week simulcast on both CW 46 and My TV 12. The following Monday, April 16th, the WBTV News at Ten on My TV 12 premieres with all new graphics and a new 30 minute format designed to take advantage of the program's shorter length and faster pace. Anchor Molly Grantham, Sports Anchor Delano Little and Meteorologist Eric Thomas will continue to be part of the broadcast. The move marks the end of an almost decade long run of the WBTV News at Ten on Channel 46 which began in September 2003. It comes as a result of independent research regarding viewers of late news in the Charlotte market according to Shawn Harris, Vice-President and General Manager of both CW 46 and My TV12. "We commissioned research to tell us how to best serve this community with our news partnership. One of their strategic recommendations was to take advantage of the more news friendly audience available to us on My TV12" Harris said. Harris also reiterated the importance lead in programming plays for late news audience delivery, and the strength of My Network programming locally as fundamental considerations in making the change. 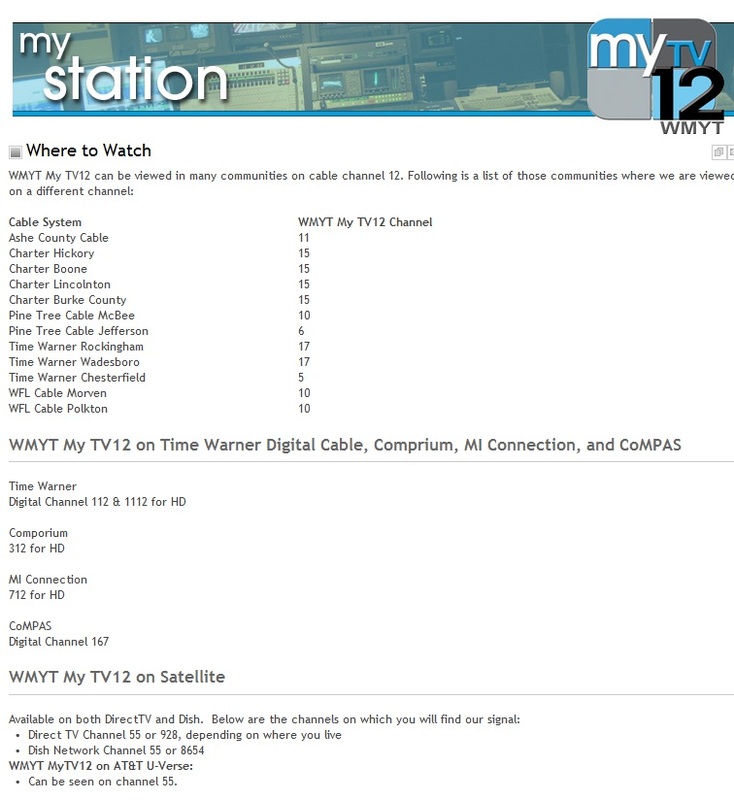 My TV12 is one of the top 5 rated My Network affiliates in the country according to information provided by the network. WBTV News Content Director Dennis Milligan and Vice-President/General Manager Nick Simonette agree the move will provide the best opportunity for growth in a highly competitive 10:00 news marketplace. "Shawn and his team have done their homework. With more news friendly viewers on My Network, and some subtle changes in the format, we're confident Dennis and his team will move this show forward to even greater success" said Simonette.